~ ~ In May 1882 a terrible fire consumed Tombstone's business district. That included every deluxe, major hotel. Those left were Fly's boarding-house & Nellie Cashman's American Hotel. But they endured some fire preventative damage. Some smaller lodgings remained also: Russ House, San Jose House, American House & Le Van House. ~ ~ Through most of the rest of that year the town's coffers suffered as businesses needed to rebuild. Many didn't have insurance to cover their losses. #2 - Entrepreneurs With an Idea! ~ ~ Joseph Pascholy & Godfrey Tribolet were well known in town. They'd already been involved in business. Pascholy had owned mining interests & was a former partner with Nellie Cashman in the Russ House. Tribolet was one of the entrepreneurs for the Golden Eagle Brewery. ~ ~ They both realized the need for a 1st-class hotel. They got together to plan construction of this facility, to begin in early 1883. 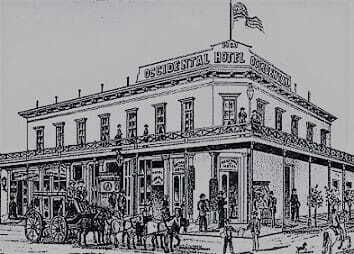 They called it the Occidental Hotel. ~ ~ Right away in 1883 the construction process did begin. The site was the Northeast corner of Allen & 4th Streets. It was a major undertaking. ~ ~ The plans called for adobe construction. It was to have 2 floors & 40 guest rooms. Also included was a premier style restaurant, a splendid bar area with billiard tables & card-playing rooms. ~ ~ When completed, it contained a total of 75 rooms altogether! Numerous mentions were made over time that its capacity was for 80 to 100 guests. It was described by a Bisbee newspaper as "one of the best fitted up hotels in Arizona... the stopping place of a number of millionaires who were visitors to Tombstone." ~ ~ The Grand Opening was on April 7, 1883., you're invited for a virtual stay! Room rates were 50 cents to $2 per night. Find your way to the corner portion of the lot that held the Cosmopolitan Hotel before the 1882 fire. ~ ~ The bottom floor was mainly dedicated to varied businesses. There was a law office, a newspaper stand & stationary/gift shop, a barber shop/hair salon, a tailor & a livery office. ~ ~ The most historically famous was the depot office for the Tombstone to Benson Stage Stop. Robert Crouch was the stage line proprietor. He was better known as "Sandy Bob." ~ ~ The Occidental Hotel had a nice veranda along 2 sides of its upper level. It had 60 ft. of frontage along Allen St. & went around the corner onto 4th St. for a depth of almost 100 ft.
~ ~ Many meetings & events were held at the hotel. Other affairs took place outside. The veranda was used as a viewing spot. Women in particular were invited to use that area. The floor of that balcony formed the roof over the boardwalk below. Imagine yourself watching the Independence Day Parade from the Veranda or the Boardwalk! ~ ~ People from out of town even came to Tombstone to be married. Some were married at the Occidental. Others were wed elsewhere & held their reception in their party rooms. ~ ~ Physicians came to town, booking a room for a time. They'd advertise their consultation services while staying in town. Sometimes their consultation had no charge. If they began treatment, there were various charges. ~ ~ In mid October of 1883, Godfrey Tribolet began having legal problems. He even faced prison time & had to hire attorneys. He sold out his interest in the Occidental Hotel. ~ ~ In August 1887 Cochise County published tax assessments on properties. Joseph Pascholy had an assessment of $1000, but along with him was listed a Mr. Sanford. Both were listed for a hotel, which was the Occidental. #7 - A Sudden End - But Slow Death! ~ ~ In mid September of 1888, an opera troupe from Mexico was staying at the Occidental. One of its members accidentally bumped into an oil lamp. It was knocked over, broke apart & immediately spread flames through the hotel room. Then burst on throughout. ~ ~ Everyone evacuated, barely escaping into the street! It was about an hour after midnight, so most had to be rousted from their beds. ~ ~ The building fully burned down, except for the outer adobe walls. $10,000 of insurance didn't cover the $25,000 of hotel property loss - never mind the customers' losses! ~ ~ It was never rebuilt. Not only that. The adobe walls that survived remained on the lot for over a decade. As time went on, they began to deteriorate even more. Around 1905 the discussion in town was: why is nothing done about the dangerous eyesore of these ruins? ~ ~ Then in 1907, a part of 1 wall collapsed. No one was hurt. The town council finally decided it was time to act. They were about to condemn the property. ~ ~ The owner at that time, Douglas Gray, was contacted. He planned a project to replace the ruins of the Occidental Hotel. It was a building that could contain a number of shops along the frontage of Allen Street - & around the corner onto 4th. You can go by to see what's there today! ~ ~ We love researching all the historic buildings that have come & gone in Tombstone. And those involved in their history - who've made up the past of this town we live in. We see the places they lived. Walk the streets they walked. Imagine how it was when they were here! ~ ~ And we enjoy sharing it with you! We hope we'll see you in town, getting a chance to walk by the NE corner of Allen & 4th. See the shop that's there now, think of what has preceded it over the years! Think about the actual stage stop that was there at one time. ~ ~ This year the Octoberfest Celebration sponsored by Tombstone Brewing Company was held a little earlier than October. They combined it with a Barbecue Competition sponsored by Puny John's on September 29th. ~ ~ We didn't attend. A friend of ours spoke to Jon, Tombstone Brewing's bartender, a few days afterwards. He said it was quite busy that day. So sounds like it was a success. ~ ~ As members of Local-First-Arizona, we're giving a shout-out to Tombstone Brewing Company for supporting the Block Party event in Bisbee in September. Local First Arizona is a non-profit. They "support, promote and advocate for a strong local business community and raise public awareness of the economic and cultural benefits provided by strong local economies." If you live in another state (or country's locality) - perhaps your state has a similar organization. We believe it's a worthy cause, and good economics to support your local businesses. One of the motivations for our website, as well. ~ ~ A nice building & adjacent property on the North side of Fremont Street at 720. It has been vacant about a year or more now. Finally someone new there! They're opening an Antiques Shop. But not only that - it's called an Antiques Mall. They take consignments from different vendors. The Grand Opening is October 6th from 10 am to 6 pm. ~ ~ Well this Antique shop has actually been open for a few weeks. We haven't gotten over there yet. And we still haven't gotten to the new bakery yet - or taken a ride on that new trolley tour. Truth is we've been traveling ourselves - a bit over this summer & into the autumn. We will get to it, though! Definitely! !